Freshly pick the Easy Squeezy Fruit and Veg Stand Playset for your little Shopkins. This mini-market stall comes with moveable parts and areas for attaching your Shopkins characters. Take them on a ride down the orange juice slide or have a go on the bouncy scales. Your Shopkins playset also comes with two exclusive figures and a collector's guide to over 100 characters. Can you collect all the Shopkins gang? 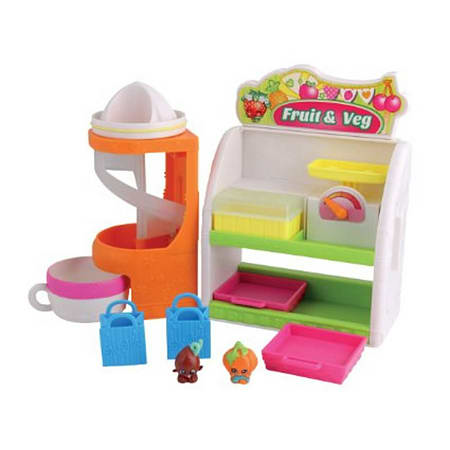 The Fruit and Veg playset is ideal for shopaholics aged five years and up. Connect all the Shopkins playsets together to make one large supermarket. The Shopkins Fruit & Veg Stand is ideal for shopaholics aged five years and up.